The Line 1 capacity of the plant is 2 MTPA which was commissioned in 2008. Currently Line 2 of the plant with a capacity of another 1.5 MTPA was commissioned in 2012. 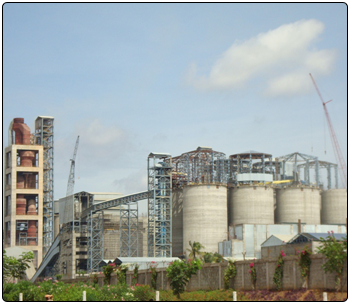 Ultra-modern Plant which incorporates the latest technologies in cement manufacture. Locational advantage of being situated in the suburb of Ariyalur, where the country’s best quality limestone is available. Employs two bulk solid analyzers at the crusher site itself for quality control at the raw material stage itself. Blending of the limestone available in different mines, to achieve the desired quality of raw mix. Only a small quantity of fire clay is being used as an additive. Large raw material and additive storage sheds to store and run the Plant without interruption. Modern X-Ray Analyser and online quality control of raw mix and XRD. Wagon tippler arrangement for quickly unloading the coal receipts. The largest VRM for raw mix and cement grinding quality. Four large Packing Plants for quick packing and uninterrupted cement supply to the dealers & customers.